On one end we find people crying about the dying habit of reading and on the other, we see self-publishing is a growing trend. I personally think that with the availability of self-publishing platforms people are getting bolder. And, instead of trying to keep the writer within them in control, they get rid of the hesitation and take bold steps to get published. It is a good sign. Not only for the market but for the individuals also. No one is born a fantastic and bestselling author or writer, one has to do efforts to reach to that stage. 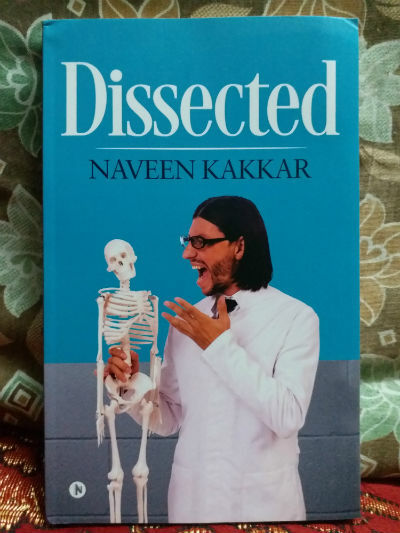 Recently when we came across a book named Dissected by debutante author Naveen Kakkar (approached by him) whose book is published by Notion press, we were not sure about whether to go for it or not?! But, two things made us go for the book (1) The interesting cover of the book and (2) The background of the author! Naveen Kakkar is an experienced and respected teacher in a medical college. Naveen is known for writing small articles for various occasions and has a good command on words, especially the humor. Once he was encouraged by one of his classmates that he should go ahead and write something bigger. And, it was possibly the pushing point the author within him was waiting for :). Eventually, he went ahead and write a book named Dissected which we are going to talk today about. The cover page is crafted using black, white, grey and light blue color. It goes easy on the eye, but not on the funny bones! A medical student engaging himself in a conversation with a skeleton held in his hands represents the book in an impressive manner. The cover page makes it clear that the book is a humorous one and is set up in the medical field, possibly medical college. And the book title “Dissected” confirms the judgment. Overall, a good cover page. Actually, it is a story which moves ahead, it looks more like a collection of a different set of incidents happened in the lives of a few students in a fictional medical college. The main canvas of the story is the Dale Medical College in Damsar. It all starts with the introduction of freshers joining this medical college. They are nervous and yet some of them are flamboyant too. As they are little scared of what lies ahead they are looking forward to explore their respective college lives and earning the degree they have joined for. And yes, they have a lot of expectations (especially from their parents) to fulfill. From the introduction scenario, it goes ahead with the raging chapter. And then the journey takes the reader through the canteen of the college, the bookshop near the college, their outing, the fete arranged in the college, the education trip, their experiences with medical education, their visit to an old age home and ultimately through their exam! I would rather like to leave it for you to explore the journey of main characters including but not limited to Tazo, Podgy, Palak, Martin, Jas, Joy, Lego, Flames, and others while reading the book. Let me start with a disclaimer that we’ve received the book against unbiased and genuine book reviews. The book is targetted for a specific set of readers. College students, especially the ones who are going through their study in the medical field, can enjoy it more than the others. Of course, like any other art, humor is also a universal language. The definition of humor can be different for different people. The author has written the book like a masala film. He tried infusing the dose of almost everything in the book which can engage readers to it. What I like the most in the book are the satire and humor. The way the author plays with the words and weaves them in a presentable package is really worth appreciation. At the same time, there are references to adulteries. Of course, it is not new and it is not out of the context, but I personally don’t like those things in this book. It is quite possible that some readers may enjoy it. Some segment of the book reminded me of Chetan Bhagat books. I also think that the page quality of the book could have been better. When you turn the chapter starting page, you will see the impression of the content in the back of the same (very light though). At the same time, the graphic illustrations along with each chapter title are really interesting and they set the mood for the respective chapter. The book doesn’t have a preface, foreword, Acknowledgements, Index, Table of Contents or Glossary! A lone half rusted lamp angled forward as if trying to see what was beneath. The fans went about their jobs noisily with a constant whirr, three of them even doing half rounds of each other’s perimeters as they wandered about like lazy helicopters in a recce in the desert. Sounds interesting, right?! Here is another one. The clock, the inanimate object that it was, still did seem to cry out in anguish at having its snooze buttons set till ten. See how beautifully he represents that a person is crying. Sentiments welled up inside and came out through the gap between her eyelids. It will put a smile on your face while actually, you are reading an emotional statement! It was accompanied by a set of nicotine-stained yellow teeth, the front two of which were positioned as if they would jump out anytime to commit suicide rather than get more chocked with smoke. Here is another example. The author is talking about the appearances of the people living in an old age home. Now they are a pale shadow of themselves, eager for love and care from their families who have abandoned them. As you can see, both of the above mentioned segments describe appearances in contrast, but the author does justice to both. The only proof of evolution is when you dance at the parties. I can’t make out the difference between apes and you all. One last thing, please respect the dead and understand that they too are your teachers. Dinner was Rajmah, fluffed up white rice with each grain sticking to each other as if scared of Mishraji. A wafer-thin sandwich and a tired looking samosa stared at him as if in jest. He felt like the mythological Sita and desperately prayed for the floor to part and take him deep in its recess. He could see the pen lying beneath his table but with twelve dead bodies keeping guard, he didn’t dare to pick it. The following lines are not only a satirical humor, but they also represent the caged mentality, and actually, that is what a satire is! Sharmaji knew how to hit the bull’s eye. The ego tickled, one would hurriedly drop the book by the Indian author and flick through the pages of the big fat book written by foreign authors. These lines are proof of the author’s understanding of human behavior and psychology. The idea behind sharing the content of the book (of course, in the spoiler-free manner) is, you yourself can check the kind of writing is there in the book and whether you should go for it. If someone asks me about the best segment of the book, I will possibly point out the “old age home visit” chapter of the book. It is an emotional segment which represents a harsh reality of the society. The loneliness of the elders living far from their loved ones is represented quite effectively. The gambling chapter is good and it reminded me of a similar scene for the Mahabharata. For a good part of next 18 months, this is going to your main past time. Also, the author could have paid attention while writing phrases like “Jas’s”. Of course, Jas is the short form of a name, but then also the author could have been settled with “Jas'” here (It is found on page 64/65). Sometimes the discussion becomes technical or boring and thus gives a bumpy ride. Maybe it is not the case with those who are studying in the medical field. Also, the scenes are changed without any indication! A separator between scenes could have made the reading experience better. The character names are also not so easy to link to, so the author could possibly work something there as well. For the books focused on humor, this should be a segment where the reader doesn’t need to pay attention. Overall, the book has more positives then the letdowns and the target readers will find it entertaining. Everyone has their favorite genre or type of writing which amuses him/her, so the choices are individual. I have mixed feelings for the book. Some of the parts of the book are really good, the humor and satire through the wordplay are something not to be missed. It can be a travel companion. I would give it somewhere around 7 out of 10. Read the book and thoroughly enjoyed it. Thanks for reviewing it.